After receiving Titanic's distress signals, RMS Carpathia arrived at 4:10am to rescue any survivors, just under two hours after Titanic had sunk. At 8:50am she left the area, having picked up 706 survivors and their lifeboats. They were all: cold, damp and very upset at what had happened. 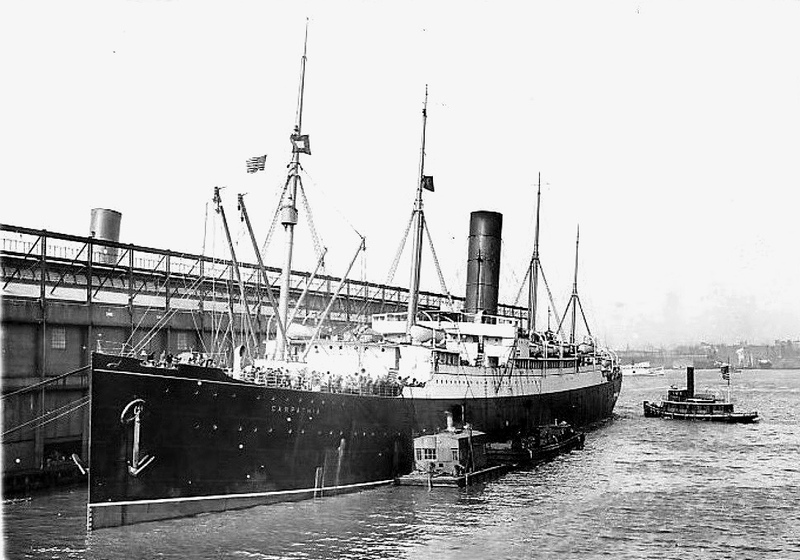 At 9pm on the 18th April 1912 the Carpathia arrived in New York. As she passed the Statue of Liberty, thousands of people were there to watch. Many people were shocked that the Titanic could sink with such a great loss of life despite all of her technological advances - 706 survivors is just 31% of the 2,223 people who were on board. 1,517 people had died. Newspapers were filled with stories and descriptions of the disaster and were eager to get the latest information. Many charities were set up to help the victims and their families. Special concerts were organised which managed to raise $12,000 in benefits. A Swede, Alma Pålsson, was travelling third class with four children aged under 10 to meet her husband; all died. It is said that Pålsson's grief was the most acute of all those who visited the offices of the White Star Line in New York following the disaster, but his loss was the greatest. His whole family had been wiped out. Several ships were sent out to the disaster site to search for bodies. A total of 328 bodies were found floating around in the area. A wide variety of cargo was claimed as lost. This included: a Renault automobile, 3,364 bags of mail, five grand pianos and a cask of china pottery heading for Tiffany's department store in New York. the agreement that rockets at sea would be interpreted as distress signals only. There are many memorials to the Titanic. In Southampton, for example, there is a memorial to the engineers who remained at their posts until the bitter end, keeping the lights working so that the passengers had a chance of finding their way to the lifeboats.